It was perfect beach weather last weekend. Just as well since we were staying at a beach house 300 meters away from the beautiful sandy shores at Mount Maunganui. Straight after work last Friday we threw our gears into the car, collected a toddler from daycare and headed straight onto SH1 south. A brief stop for dinner at my folks restaurant and we arrived at our destination a little shy of 3 hours. We were back in holiday mode! We lazed around the house Saturday morning before making our way to the sand. It feels so fabulous to be in the sunshine, on the sand, watching the crashing of waves as you breathe in the salty air. 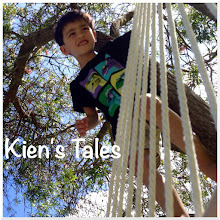 Kien loves to run around with his camera taking photos. Jef showed off his woodworking skills. It was an awesome morning at Mt Maunganui beach. Kien's second, second cousin - sister to Thomas. Three weeks old and cute as can be. We spent a pleasant afternoon hanging out at Michelle and Mat's place. Mid afternoon and we chucked Kien in the backpack and made our way up to the top of the mountain. This was where our cruise liner docked last year when we came through for the day. On the way down we came across a beautiful native bird, the Tui. It was a splendid walk indeed. Of course a hot and sunny day isn't complete unless there is a gathering and a BBQ to top it all off. So the family congregated at the house for aforementioned gathering. Sophie looks like a doll in her pretty little dress. It was so good to see everyone last weekend, and to meet the new addition. You forget how little these creatures are when they come out. They look so delicate in the arms of strong, handsome men.